Summary: Justyce McAllister is top of his class and set for the Ivy League—but none of that matters to the police officer who just put him in handcuffs. And despite leaving his rough neighborhood behind, he can't escape the scorn of his former peers or the ridicule of his new classmates. Justyce looks to the teachings of Dr. Martin Luther King Jr. for answers. But do they hold up anymore? He starts a journal to Dr. King to find out. Then comes the day Justyce goes driving with his best friend, Manny, windows rolled down, music turned up—way up, sparking the fury of a white off-duty cop beside them. Words fly. Shots are fired. Justyce and Manny are caught in the crosshairs. In the media fallout, it's Justyce who is under attack. Emily and I both received advanced copies of this book at BookCon, and things have been so crazy that I haven't had a chance to pick up this book until now. It turns out that I have excellent timing, because this book came out to the public just a few days ago, so now whoever you are, you're totally capable of getting your hands on this book as well! As the summary explains, Justyce is a senior in high school, all set to go to Yale, and he finds himself unfairly put in handcuffs after a misunderstanding where he was helping his drunk ex-girlfriend get into her car while the police assumed something different. Throughout the rest of the book, Justyce encounters many different scenarios in which he realizes the racial injustices that happen on both sides, numerous times, and some of these altercations even lead to shocking results. And throughout it all, Justyce is partaking in a self-inflicted social experiment in which he tries to channel the energy of Dr. Martin Luther King Jr. in behaving the way he would have and handling situations in ways he would best be known to do. However, Justyce soon realizes that some things are trickier than he could have imagined. What I really liked about this book was all the different topics and scenarios it managed to cover. This book wasn't just about Justyce getting arrested for something he didn't do because of a misunderstanding after being racially profiled. This book also covered many different important topics and alluded to several popular cases that have happened recently in American and worldwide media. This book creates conversations that span from racial profiling to "affirmative action" and even what it's like for people not being able to "take a joke." I really enjoyed how this book went in several different directions, but it also managed to somehow go in all those directions simultaneously and everything was executed flawlessly. (Major spoilers ahead, so please skip to the next paragraph if you haven't read the book yet!) When the incident with Manny happened, I was honestly so shocked that I dropped the book. I was totally taken off guard. I had known Manny was going to die because I accidentally dropped the book while reading it, and when I picked it up, it was open to the last page and I hadn't realized until I started scanning it. So at first, I was super disappointed in myself for spoiling such a major plot point, but I was still shocked with the way things played out, so I'm still going to say that Nic Stone caught me off guard with an aspect of the story that I definitely hadn't seen coming. My favorite character in this book was definitely Justyce. Even when things were getting tough around him and he found himself to be the victim of accusations he had no part of, he was working so hard to channel the inner mind of one of the greatest and most influential men of his century, both in America and across the world. There were some times that things got really, seriously tough, and Justyce held on tight and help his ideals in mind and didn't give in. (Although there were some moments when he lost his temper, which were honestly a long time coming and so deserved, and it was good to see him let out his anger and frustration. Nic Stone did an excellent job of showing the day-to-day injustices that people of color face, and as a non-POC reader, it was eye-opening and made me rethink a lot of what I've seen going on around me in my life. This book brings so many different important topics to light that all need to be talked about, and I'm very, very glad that she did. The only thing I didn't enjoy about this book was the length! I really wish this book had been just a little bit longer, because Justyce's story hooked me right from the start and I just wanted to keep going. But other than me wishing the book was longer (which isn't a real complaint, if you know what I mean), there's nothing more I can really critique about this book. It was very tastefully done and packed a punch in all the right ways. 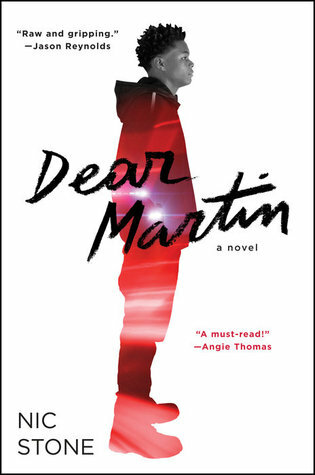 Overall, I really liked Dear Martin. I am pleasantly surprised at how shocked this book made me at all the right times, and how interesting it was to be in Justyce's head. This is a book that everyone needs to read. Similar to The Hate U Give by Angie Thomas, this book will touch you and shake you up in ways that you didn't expect. And it's the kind of shake-up that you need -- so you should add this book to your TBR as soon as possible and experience this excellent story for yourself.